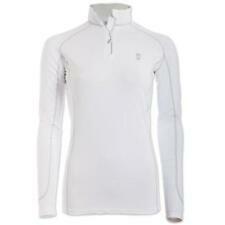 NWT Tredstep Symphony Futura Sport Top White Size XL/14 US 16 UK. Grey/pink size S. Blue/red size L.
Designer: Tredstep. Style: Polo. Has multiple embroidered logos all over. Shoulder seam to shoulder seam: 13". Length from back collar seam to end of shirt: 22".